You might not say it that way, but when we face obstacles in the form of people, we're apt to consider them the problem. But what if I told you there's a way to improve the likelihood of getting that other person to change? And it starts with you? 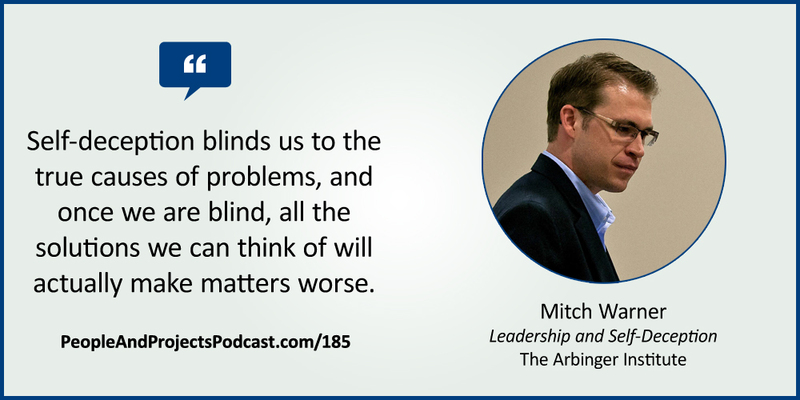 In this episode we're talking with Mitch Warner from The Arbinger Institute about their book Leadership and Self-Deception: Getting Out of the Box. It's a must-read book that I look forward to introducing you to in this episode. The Anatomy of Peace. This is a continuation of the story that starts in Leadership and Self-Deception. The The Outward Mindset. This takes the ideas and presents them in a form to help you implement the ideas from the fictional story. IN A DREAM WHERE I'M SLEEPING by Shatterfreak Licensed under a Creative Commons: Attribution-Noncommercial-ShareAlike 3.0 United States License.